There are a lot of processes that are involved in the planning and implementation of a wedding event and the programs included in the occasion. Though it would cost more, hiring the services of a wedding planner can minimize the stress of the couple in terms of all the preparations that they need to do for the wedding day. There are already a lot of wedding planners out there, which is why it is very important for these businesses to assure that even the most minute details of their operations and services will stand out from their competitors. A wedding planner logo is very essential as it represents the entirety of the business in so many ways. We can provide you with wedding planner logo samples and Wedding Logo Templates, which you may download and use as references. Your wedding planning business must have a visual brand where people can associate you to a particular logo. Identifying the logo appropriate for your business operations is one of the first things that you need to do if you want to put up a wedding planning business. 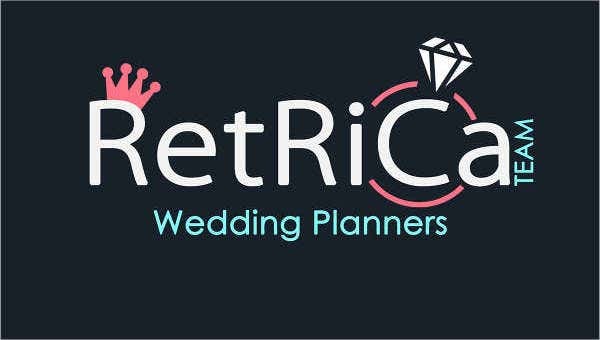 You can use a word mark or a logo type where the entire business name is used as the logo of your wedding planning business. This is applicable if your business name is catchy, precise, short, and memorable. You may also use a letter mark logo where the initials of your brand name may be used. This is usable for businesses who have long names or those who cannot be properly pronounced by many people. A wedding planning business brand mark consists of symbols and/or other icons that can uniquely identify the business as a brand. Combination marks or iconic logo types may also be used by the wedding planning business to include the name of the business and the symbol that represents it together as a logo. An emblem wedding planning business logo may also be used if the business wants to use a more unique and original logo, which usually consists of the business name encapsulated within a symbol or a shape. Other than our wedding planner logo templates, our samples of Vintage Advertising Logos are also available for download. It will represent the wedding planning business for the longest time of operations except if the business owners decide to change it. It helps in creating the quality of the brand and how people are to perceive the wedding planning business as a whole. It provides the aesthetic that prospective clients may expect from the wedding planner. It helps the business to be separated from its competitors, which is very important in a marketplace where there are a lot of threats to the business operations. It allows the wedding planner to give emphasis to the visuals that they can showcase, which is a reflection of the business operations and their service offerings. Aside from our wedding planner logo design samples, you may also want to download our templates of Architecture Logo Designs.